"Memberships" can mean a variety of different things depending on what your organization does. Most of the time, memberships are paid for by dues. Flipcause is designed to serve as a payment processing portal for those membership dues. First we'll explore the background of how it will work, second we'll go through a detailed setup of a Membership campaign. 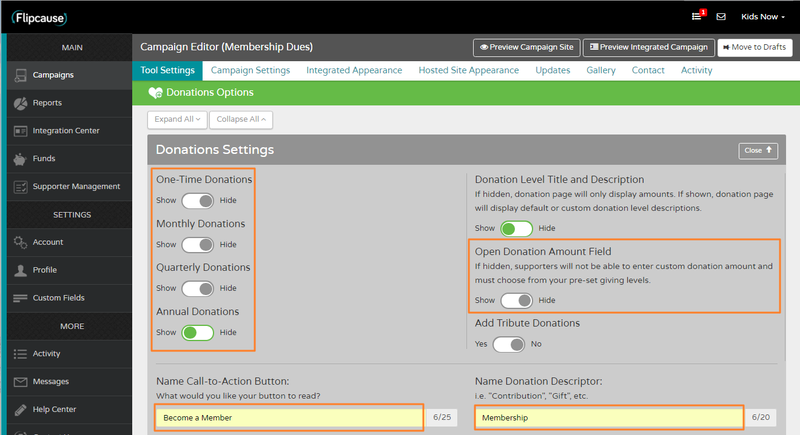 Setting up your membership dues via Flipcause campaign has several benefits: automated receipts and thank-yous to your members, customization over how much of the membership is tax deductible, unlimited price levels, automatically email membership discount codes for events, reporting capabilities on who signed up as a member, and management of recurring payments (if you set up the membership dues as a recurring donation). In the receipt your members receive for the transaction, it can state how much is tax deductible, and it will include a link to access and alter their payment settings or turn off the payment (if set up as a recurring donation). Since you can rename any tool on Flipcause to "Membership," you can use any tool that will require a payment to set up your membership options (Donation, Registration, Sponsorship, Online Store). We typically set Membership Dues using the Donation Appeal tool, which allows us to list multiple levels and price points as well as set up automatically recurring payments. And we always want to set up recurring payments whenever possible! Using Donations, Supporters will be able to sign up for Annual, Quarterly, Monthly, or even One-Time installments for their dues and you'll be able to customize the price of every single option. Please note, that the Donation Appeal tool is the only tool that supports recurring payments. Once a new member has paid their dues via Flipcause campaign, they will receive their receipt and your organization will receive a notification of the new dues payment in real time, so you can take action to onboard the new member and provide the appropriate membership benefits. If the membership benefits involve discounts to events or links to content, that can also be sent automatically via the customizable receipt. Before you begin, you'll want to make sure your website has a dedicated Membership page or area that explains the membership levels and benefits. Within that page is where the call-to-action for Membership Dues payment will lie, and the Flipcause campaign is what will be used for that call-to-action. STEP 1. Create a campaign and pick the tool to use for this. (In this example, we'll use Donation Appeal). STEP 2. 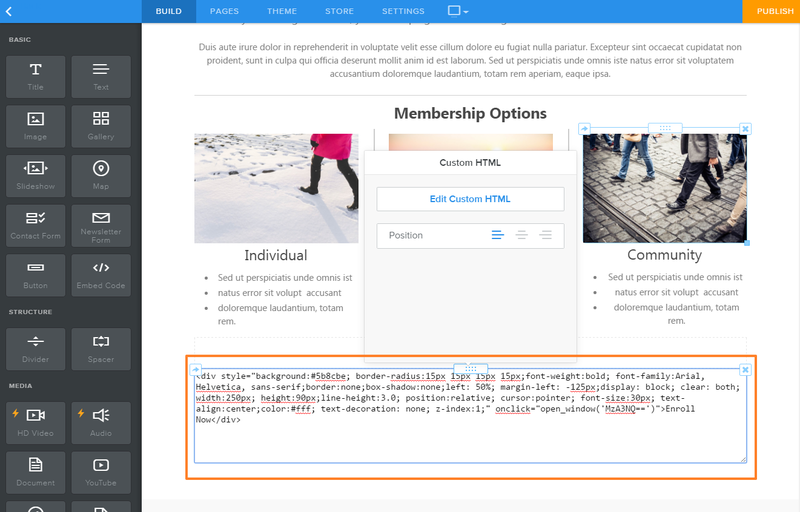 Regardless of the tool chosen, we'll want to rename the tool descriptor to "Membership" to alter the language that will display to your supporters. STEP 4. Set the membership price level(s). Go to Campaigns > Create a New Campaign > Donation Appeal. Title this "Membership" or something similar. This completes Step 1. Cick "Edit this campaign" on the new Membership campaign created > Tool Settings > Manage Donations. In the first Donation Settings section, we'll be able to take care of Step 2 and 3. First, toggle off any payment frequencies you don't want displayed. If you want this to be an annual only option, turn off "one-time," "monthly," and "quarterly. Next, turn off "Open Donation Amount Field" if you want to remove the ability for people to enter a custom amount. Next, rename the Call-to-Action button from "Make a Donation" to "Become a Member" or similar. Right next to it is where you can change the name "Donation" to "Membership"
In the next area, we can add a custom message to the Thank You page, which will appear right after the membership payment is processed. 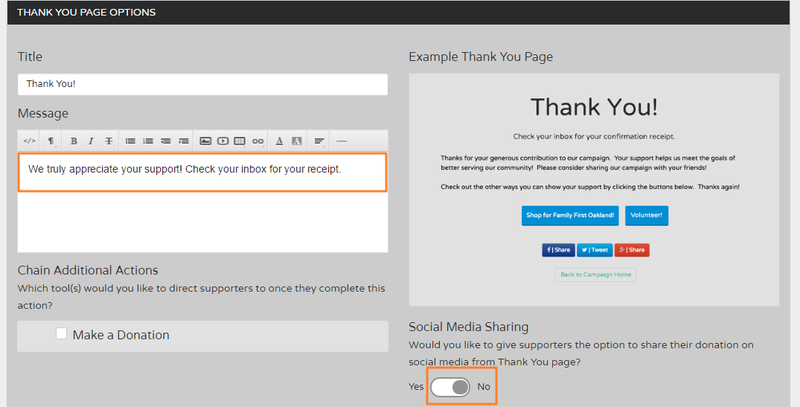 Here, we'll turn off the social-media sharing buttons on the Thank You page. After this, we will set which information we'd like to collect from members. 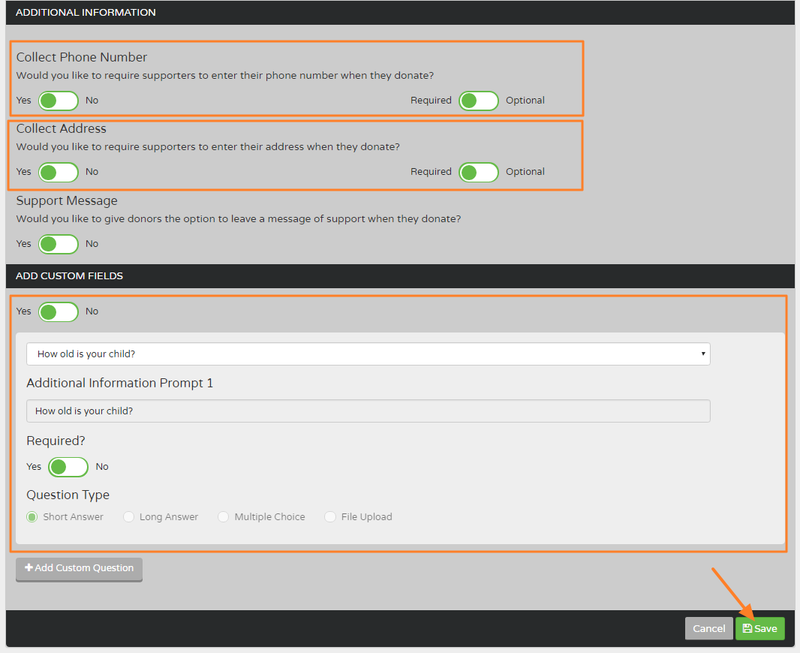 Keep in mind, that First Name, Last Name, and Email Address are always required on Flipcause, which is why you won't see those two options listed here. In Additional Information we can collect their Phone Number and Address, and we can use Custom Fields to collect any custom information we'd like. Once all of the options are set, don't forget to hit Save! We just finished Step 2 and 3! On to the last step, setting your Membership Dues levels. 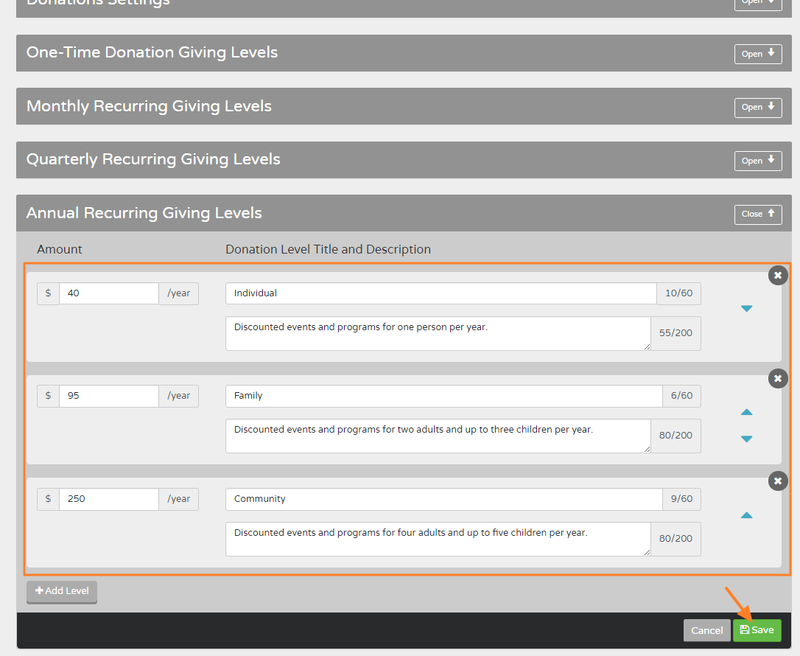 Below the Donation Settings section we were just working in, you'll see the options to set different giving levels. Since we are only using Annual for this one, we don't need to worry about setting up one-time, monthly, or quarterly. We do, however, need to first uncheck the box in Monthly that syncs the recurring levels together, which will allow us to enter custom amounts into the Annual levels. Go into Monthly Recurring Giving Levels > Edit > uncheck the box > Save. After saving the Monthly section, click on Annual > Edit > configure your Membership levels, any descriptions you'd like to add, and click Save. Now you're ready to add this campaign to your Membership page!